Global business coach, top-rated podcast host, and best-selling online educator. I help people start digital businesses and grow them to 6-figures. Welcome, I’m so glad you are here! Most days you can find me coaching clients or interviewing cool podcast guests from my desk in my airy apartment in Vancouver with an almond milk latte in hand, grapefruit essential oil diffusing, and a few crystals sitting beside me. 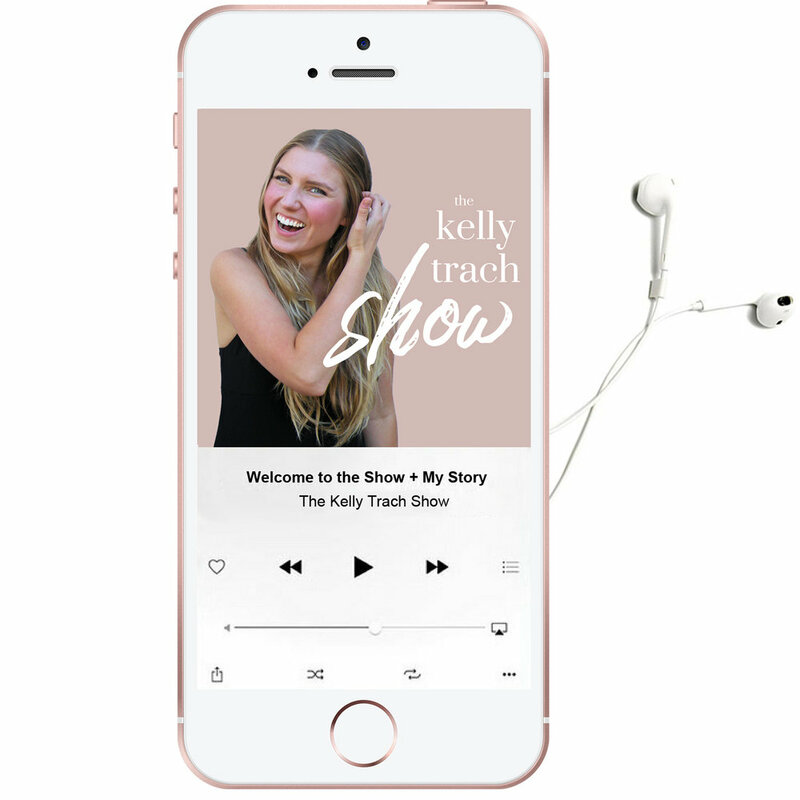 I’m mostly know for my top-rated self-help podcast called The Kelly Trach Show that features high profile guests from around the globe and where thousands of listeners tune into the show on the daily. P.S. it’s received more than 100,000 downloads! I love serving the world by teaching others how to find the courage to pursue a life and business they truly adore. As a person who “hustled and grinded” in business school and with my first three businesses, I hit a rock bottom and decided to dump everything society taught me and build a lifestyle business instead based on ease. I monetized my genius, cashed in on what came most naturally to me, and now I make 80% of my revenue through passive income while traveling to tropical beaches and enjoying a first-class lifestyle. Now, I help other people build a heart-centered digital business, live the laptop life, make money through passive income, and earn 6-figures by pursuing their passion. I’m also known for popular and best-selling online courses: Your Best Life, Your Conscious Empire, and Your Money Mindset where I teach people how to unlock their potential for confidence, entrepreneurial success, and wealth. I am most passionate about pursuing world-changing work, making a lotta money in a way that fuels the lifestyle you desire, and watching my students and clients live a liberated life by doing what they adore. So, welcome! I’m so stoked that you are here and it’s a pleasure to meet you. Well, let me tell you upfront that this was not in my 10-year vision. I was a business school, honors grad who went to school on scholarship and if you asked me what I was aiming for it was a high paying corporate tech job, a Stanford MBA, or my ticket to YCombinator. If you look at my professional resume, you'll find a gig at Tesla Motors, three failed tech start-ups, a prestigious Silicon Valley entrepreneurship school and time living in San Francisco trying to get my first three start-ups off the ground. During a low point of my third (and final) tech-startup, I had an aha moment that I should just do what I'm good at, lean into my genius, and cash in on what comes most naturally to me. So, I waved goodbye to tech, ditched my life that looked so good on paper (yes was deeply unfilling), and chose to tap into what my soul was calling me to do. So, I moved back home to my parents home in Canada, started working from my childhood bedroom and build my fourth business which is this one. In two short years, I went from zero to financially free. I made the flip from living at home with my family to earning a full-time salary, hiring a team of employees, and teaching thousands worldwide through my podcast, courses, and coaching practice. And now, I teach others how to do the same. • Bachelors of Commerce Honors Degree from the UBC Sauder School of Business - one of Canada's most competitive and selective business schools with only a 6% acceptance rate. I studied on full scholarship, specialized in marketing + graduated on the dean’s list honor roll. • Full scholarship recipient for Draper University, a pre-accelerator program in Silicon Valley for early-stage entrepreneurs taught by billionaire venture capitalist, Tim Draper and mentors from Stanford, SingularityU, Google, and various VC firms. • Studied media and communications in Paris, France at Sciences Po, one of the most prestigious and elite European schools. • Worked for Tesla Motors and learned everything about high-level sales and exceptional service. • I’ve been celebrated with 19 different awards, including a Top 20 under 20 award and I’ve been recognized by the Canadian Federation of Women, The Royal Bank of Canada, and The Minerva Foundation. • 4x entrepreneur with real-world, hands-on experience from business school, founding 3 tech-startups in silicon valley, and the experience of building a fourth successful digital business. Tune into my top-rated podcast here. With 100k downloads from all over the globe, you know it’s gotta be good! I live by the ocean in beautiful Vancouver, Canada. I adore crystals, manifesting, and the law of attraction. I love beautiful sparkly things and everything blush pink. I’m plant-based and I’ll eat all the hummus at your party. I love cozy nights in and working from home everyday. Fresh flowers are my favorite treat and especially peonies. If you give me an almond milk latte, I’ll be a happy gal. Heated vinyasa is my favorite. Yes, I wear this exact outfit. I’m a sucker for neutrals, pretty things and good design. Hawaii is my favorite place and we go at least twice a year. Join thousands of others here. I've helped countless people discover the courage to go for what they truly desire, live the laptop lifestyle, and build successful digital businesses. I'm here to help you turn your dreams into your reality. By sharing what has been truly transformation for me, I'm here to serve. My work is built on a foundation of vulnerability, deep devotion, and a commitment to your personal growth. Through my podcast, coaching, and online courses, I'm here to help you elevate your life, go for what you truly desire, and step into the person you know you are meant to become. Because you're not just going for bright, but blazing. Bust through your blocks, step into your self-worth, and change your financial reality for good. Master your fear, doubt, worry and finally go after what you really desire. Get your business finally off the ground and start making some serious conscious cash.